The Irish boss must be the only person in the country without an opinion on his position. Declan Kidney needs to beat France to stave off the critics. 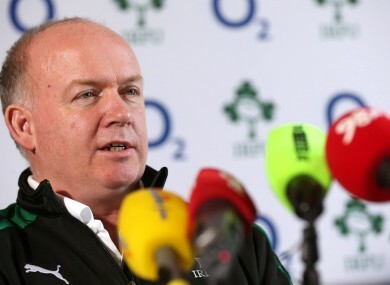 NO MATTER HOW often Irish players step forward to plead ‘mea culpa’, the questions over Declan Kidney’s future remain. Two defeats have followed a thundering start, and shuddering finish, against Wales and the only result that looks likely to buy Kidney some time would be a flaying of France at Lansdowne Road. The Irish coach fielded six direct questions on his future in the job at today’s press conference at Carton House. Kidney stuck to a line about focusing solely on the next game, one that he first told RTE after the 12-8 loss to Scotland. If his focus is truly blinkered in dedication, he must be the only rugby-loving Irish person not to ponder who will be coaching Ireland later this year. Kidney lamented the fact that Ireland only took one scoring opportunity out of the ‘eight or nine’ created against the Scots, a result he called the most disappointing in his coaching tenure. Asked if the two defeats had done irreparable damage to his hopes for a new contract, Kidney responded, “I haven’t been thinking about it really. My only concern is to help this team do as well as they can do. Kidney, not for the first time in his tenure, answered a question about injuries by stating that he did not wish to focus on them. He then talked about injuries. Asked if he wanted to stay on, Kidney said, “I’m just looking upon it as the next match. That’s the way that I’m going to keep doing it. That’s the way I’ve done it from the start. Kidney is aware that there is a sense of frustration felt by Irish rugby supporters but added that he had not sought out any newspapers since the weekend loss. Pressed about his assertions of being purely focused on the upcoming match against France, Kidney was not for shifting. Email “Kidney fighting for his coaching life but insists it is business as usual”. Feedback on “Kidney fighting for his coaching life but insists it is business as usual”.